Florida Power & Light Company says a planned solar-powered battery system in Manatee County will have four times the capacity of the largest battery system in the world. FPL Miami-Dade Solar Energy Center Tour in Miami on Oct. 18. The FPL Manatee Energy Storage Center will have 409 megawatts of capacity—the equivalent of approximately 100 million iPhone batteries or 300 million AA batteries—when it begins serving customers in late 2021. It will be charged by an existing FPL solar power plant in Manatee County. By deploying energy from the batteries when there is higher demand for electricity, FPL will offset the need to run other power plants–further reducing emissions and saving customers money through avoided fuel costs. FPL is addressing one of the major issues of solar power: Energy is only generated during the day and even cloud cover can diminish output. The battery system will get around the issue by storing enough energy to power 329,000 homes for two hours. Utilities have historically relied on “peaking” units to supplement power during times of high demand, such as when heat waves causing heavy use of air conditioning. The plan is also novel in that it will accelerate the retirement of two 1970s-era natural gas generation units. Silagy said replacing a large, aging fossil fuel plant with a mega battery next to a large solar plant is a world-first accomplishment. It will also save money for customers who already have among the lowest bills in the nation. 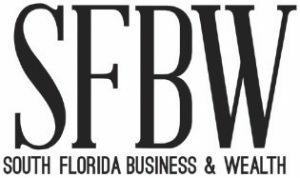 FPL is planning smaller battery installations across the state, numerous solar power plants and efficiency upgrades to existing combustion turbines at other power plants to replace the 1,638 megawatts of generating capacity. The project will save customers more than $100 million and eliminate more than 1 million tons of carbon dioxide emissions. 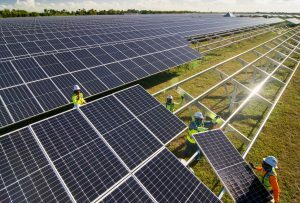 FPL is building four new solar plants, including one in Palm Beach County, with 1 million panels this year. It’s part of a plan to add 30 million panels by 2030. 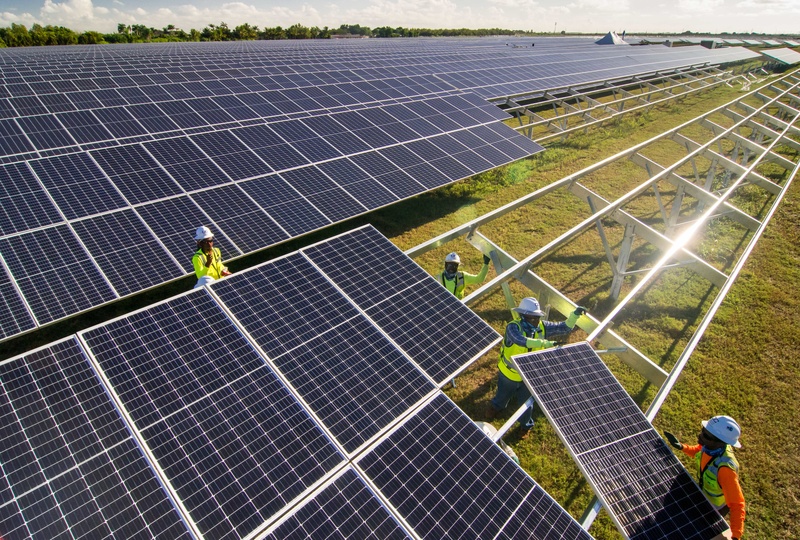 FPL already has 18 solar plants in operations. An October ranking of U.S. solar developers by Energy Acuity had NextEra Energy Resources as the largest utility conducting developments with 56 projects. FPL was ranked 15th with 12 projects. The list is led by First Solar and Sun Power, which aren’t utilities, while Next Era was third. A Wall Street Journal article concluded that a 2017 SEC filing by NextEra (NYSE: NEE) was indeed accurate—the company produces more solar and wind power than another other company globally. FPL says it has spent two decades methodically modernizing its power generation fleet and transforming it into one of the cleanest and most efficient in the country, saving customers nearly $10 billion and eliminating more than 130 million tons of carbon dioxide emissions since 2001. Much of that has involved replacing old, oil-burning plants, such as ones in Riviera Beach and Port Everglades, with highly efficient plants that run on U.S.-produced natural gas. Now, it’s even getting rid of an older natural gas plant. FPL plans to eliminate its last coal plant in Florida by the end of this year. It has already shut down two coal plants in Jacksonville, preventing nearly 7 million tons of carbon dioxide emissions annually while saving customers tens of millions of dollars in fuel and operating costs, the company says. In March, FPL unveiled the FPL SolarTogether program, the country’s largest community solar program. FPL has an Energy My Way page outlining its solar programs.